JMT | Pebble Infotech Pvt. Ltd.
Late Jayanti Shah was born a Princess yet dedicated her entire life to social service. During her lifetime she bore witness to many of her family members succumbing to cardiovascular disease and losing their lives to it. She knew the emotional and financial turmoil subjected to the living family members. This drove her to greatly empathize with the numerous not so privileged cardiovascular patients and their family. Thus she was determined to establish an organization to make cardiac care readily available/accessible to all Nepalis indigent cardiac patients. Unfortunately, she did not live to see her wishes spring to reality due to her untimely demise. However, her mother Late Helen Shah rightful paid tribute to her daughter’s wish and established the Trust naming it after her. 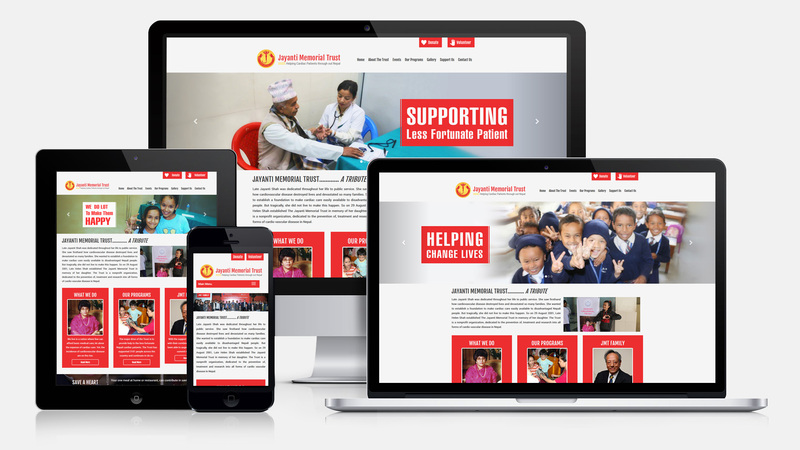 The Jayanti Memorial Trust carries the legacy of late Jayanti Shah’s wishes . It is a nonprofit organization, dedicated to the prevention ,treatment and research into all forms of cardio vascular disease in Nepal.